The game has to be installed on the same drive as Portal 2, otherwise the game may fail to start. See Missing background image. Identical video, input and audio settings as those of Portal 2. Comes bundled with a built-in level editor along with Steam Workshop support. To have subtitles translated to a language you need to change Steam to that language. Go to Steam > Properties > Interface > Select Language. Let steam restart and now subtitles will load with the new language. To have translated menus you need to do the following. Go to your Steam library and right click the game. Select properties. Then the Language tab. Select a language from the drop down menu. Only "load last autosave" shows in menu. No load options for previously saved games. If you aren't getting subtitles, see no subtitles. 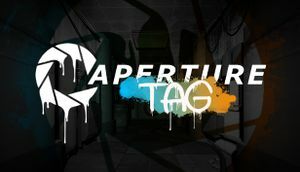 Go to your Library, find Aperture Tag, right click on it and go to Properties. Under Local files select Verify Integrity of Game Cache. Go to your Steam Community profile page then copy your profile link. Paste your link into the converter then copy the steamID64 value. Replace the folder's name with your 64-bit ID. The level editor is only available for Windows. These steps are only required once per installation. Game may default to Steam's chosen language and only show localized closed captions but not subtitles even though language is selected correctly from game's Steam properties. You may replace english with any supported languages. Some commands may first require enabling "sv_cheats". You can do so by inputting sv_cheats 1 in the console.